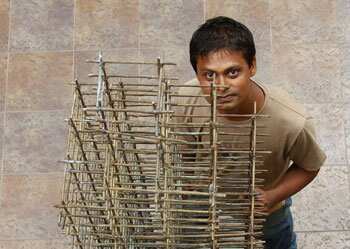 Ved Gupta with Catharsis, a series of bronze scultpures. Tubby men—fat, short and bald—are a recurring figure in the fibreglass sculptures and paintings on display in Ved Gupta’s first solo show. On the opening evening, the artist himself seemed keener to talk about his new bronze sculptures, but these rotund figures were clearly the show’s highlight. 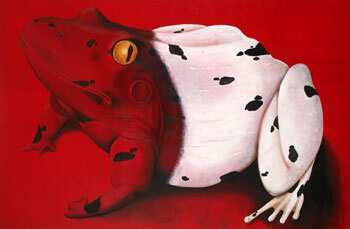 Similarly, the aesthetic appeal of a painting of a frog in emphatic red and white, titled Untitled Companion, and that of a sculpture where a big frog rests on a man’s shoulders, titled The Man with Untitled Companion II, is hardly enhanced if the frog is seen to stand for a large country to the east of India that is flooding her markets with cheap imports. Whatever the connection, it is too oblique. 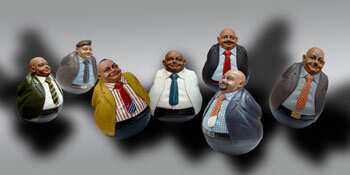 Gupta’s works pack plenty of punch on their own; they don’t need intellectual props. The net effect is that the import of these etching seems to have been deliberately obfuscated—it would take some effort on part of the viewer to comprehend what they depict. The strain of this comprehension perhaps mirrors at some level the strain the subjects are obviously under. Prices for the artworks start from Rs1lakh.